Scotland's first sport climbing guide is now in its second edition. 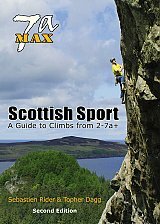 This selected guide focusses on routes up to a grade of 7a+, which covers the majority of Scotland's 1500 sport routes, whilst including the essential information for harder climbs. The new style second edition features several recently developed crags across the country, including in the popular Central Belt, Aberdeenshire, and the northern Highlands. This full-colour guide graphically showcases Scotland's sport climbs and its landscapes. 1150 climbs are described in full with 146 photographic colour-coded topos, 66 detailed crag maps, 48 action photographs, and informative icons. Crag location QR barcodes allow smartphone users to simply scan the page for instant mapping and satnav directions. The page layouts and new pocket size format is convenient both at the crag and on the move.